And, of course, all the animal bone, such as the recently discovered deposits from within the hearth of Structure Ten. Then there’s all the amazing art, including the fantastic piece found by Olivia, and the pecked stones from Structure Ten. And last, but by no means least, the painted stones, something that I’m sure no one ever expected to come up from, and makes this site even more special and important as a whole. Importantly, as well, there are the structures themselves, which are simply outstanding. The quality of workmanship is second to none. In Structure One, where I have been working, the walls are some of the most perfect examples of dry-stone walling I have ever seen. Students complete final plans in Structure One. The Ness of Brodgar is a Neolithic treasure chest — the ideal toy box for any archaeologist, and we have been well and truly spoilt by this dig. I never, in all my years, thought I would get to handle that much Neolithic pottery in the course of an excavation. I remember bemoaning my inability to find any pot during the second week, and then, within ten minutes, I had dozens of pieces. I was told to try that trick with carved stone balls, but alas to no avail. Next year maybe? I for one know that my experiences on the Ness will always hold a special place, and I will certainly try to come back. 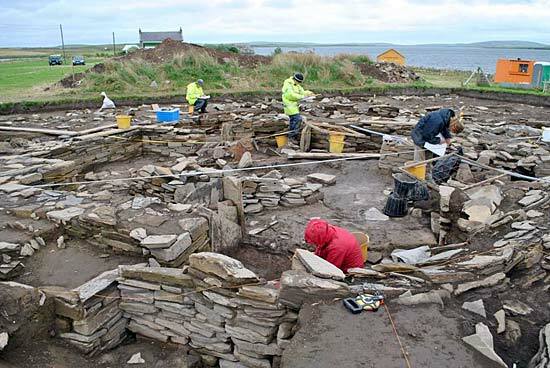 Having had the opportunity to dig on the site as part of my MA was one of the reasons I came to Orkney to do the postgraduate degree in Archaeological Practice, and it has certainly lived up to its reputation if not exceeded it. Dave completing final plans in Structure Eight. But it’s not just the archaeologists who have taken great joy in the site, but all of the visitors who have come to site — some so much they chose to come back and dig it. Indeed, the other night a group of tourists recognised me from the dig and told me how much they enjoyed the site. I never thought I’d have someone come to me in a pub and say “great dig mate”. And this is the other important thing about the site, the role the public can come to play and that the site is not the playground of a select few archaeologists but is an experience that everyone can join in. Those who have visited the site have assisted, and aided, in securing the short-term future of the dig, not by cash (although that does help), but by their interest and enthusiasm, which not only motivates us, but, the more interest that is generated the longer we can go on, as it becomes easier to convince funders etc. that what we’re doing is worthwhile. So not only do archaeologists play a role in developing and securing the future of the site, but everyone one who has visited has played a vital role, and are as much a part of the team and the experience. I for one have enjoyed being able to, in my own amateur fashion, talk to a large number of visitors and draw upon there own enthusiasm to motivate myself. Final cleaning in Structure Twelve, for photographs. In short, the Ness may have been an important site in the Neolithic, but it is just as important now. It is a place where you can hear the footsteps of the ancestors upon the flagstone floors, a place where you can peer into their buildings and gain a glimpse into an exciting, colourful (both figuratively and literally) world. And where else do you get a chance to see a floor, a wall or hold an artefact that was last seen 5,000 years ago? That to me is what it’s about and what motivates me is that process of making a direct connection with the past, and the present in discussing the site with everyone else. Hopefully see you all again next year. Next PostSo, it’s farewell from all of us. . .